Tradeshift got a makeover! The launcher on the left of your Tradeshift account now looks different; instead of a list of standard apps, the launcher is divided between your Inbox and Apps. Note that your 9 most used apps will be displayed at the top of the list! The rest of the platform is still the same, and you can use the same features as before. 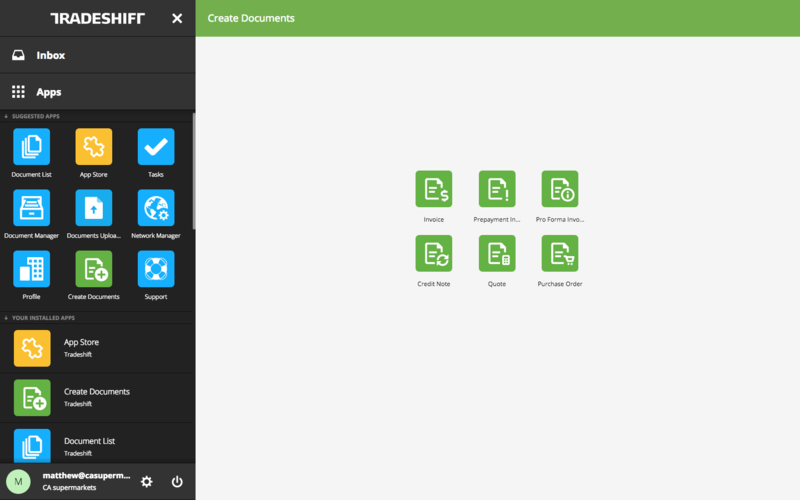 The “Create” button exists now in the form of the "Create Documents" app, which expands to suggest the different documents you can create. Click “Invoice” to create an invoice, “Purchase Order” to create a Purchase Order, and so on. Stay tuned, as we will be posting more information about this release! Sorry, your browser does not support this video tag.